Lessen the Fear of Public Speaking - Know Your Stuff! O VIDEO #5: Nuggets to Lessen the Fear of Public Speaking – Know Your STUFF! This Video is the Fifth of Nineteen about Lessening The Fear of Public Speaking! Confidence in your Competence will lower anxiety. If you’re given a Speaking Opportunity, and don’t really know your stuff, don’t take it! Remember, my mantra is, “Speaking Opportunities are Business, Career, and Leadership Opportunities.” No one has ever challenged that. Why would they! If you’re not ready for that presentation, don’t give it! Don’t blow the Speaking Opportunity! Always be up-to-date to the latest and the greatest on your topic. I’ve been studying public speaking and presentation skills a long time. I am always learning something! Till next time, this is, Fred Miller – NO SWEAT! An Elevator Speech Template and an Elevator Speech Worksheet. 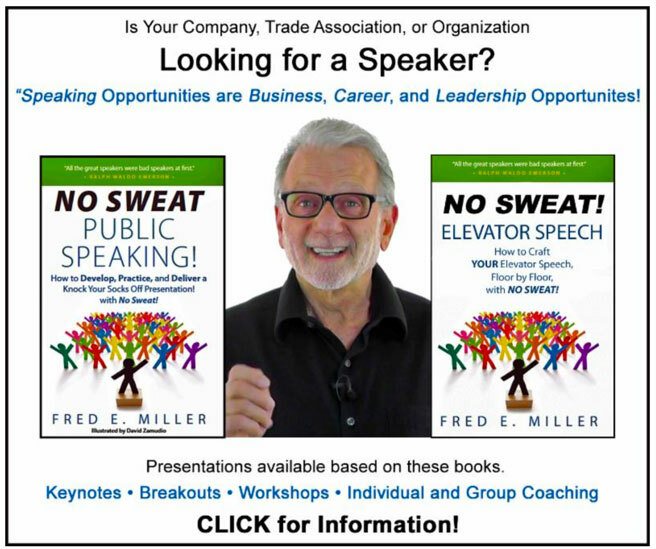 Go to: https://nosweatpublicspeaking.com/elevator-speech-template to receive it! Public Speaking and Presentation Skills. They do this because we perceive really great speakers to be Experts. Perception is reality, and we rather deal with Experts. Speaking Opportunities are Business Opportunities. Speaking Opportunities are Career Opportunities. Speaking Opportunities are Leadership Opportunities. They'll be a distraction. We cannot multi-task! Develop your own style! Don’t try to be someone else. You have a unique style.